Due to the extremely restricted size of the ground where this Territory is settled and to the fact that this ground is not owned and in some sense occupied the declaration of a real Micronation was not considered to be a realistic solution. So the declaration of an exterritorial sovereign territory was seen as a most accurate definition for the political definition. 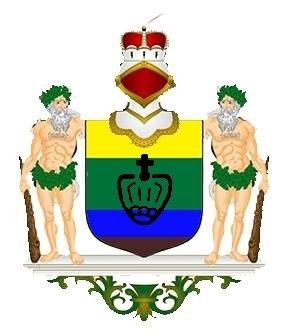 The Foundation was carried out by the Chief Administrator of the territory, who immediately assured to the new territory the acknowledgement by the State Department of the Federated Micronations (FM), giving the status of an Associated Sovereign Territory to the FNT. The Administrator is named as representative of the FM in the Territory, responsible for the diplomatic and consular functions for and on behalf of the FM in the FNT. The FNT directly took for a better identification of its special status an own flag which is based (in only little modifications) on the flag of a never realized foundation of a global wide Nation with the name Koljand in the early 1980’s. 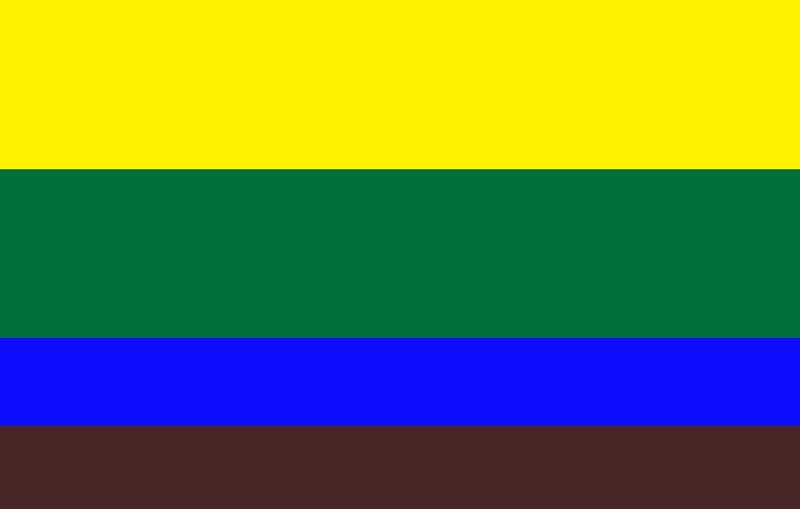 The colors present the colors of our earth: Brown for the ground, blue for the water, green for the land and plants, yellow for the sun in the sky. The short form FNT applies also for the Freija Nücke Territoria, an area declared 2015 June 7th. Until 2017, August 3rd the area belonged as an associated territory of the FNT with no defined political system, administrated by the FNT Administration. 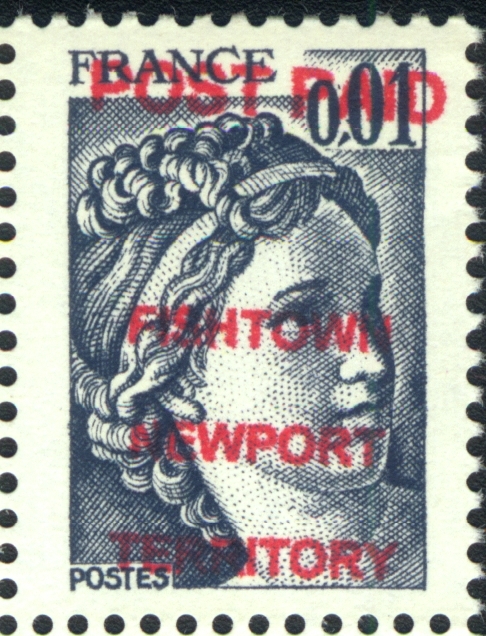 Postal services from and to this area were maintained by the postal administration of the Fishtown Newport Territory and using the post stamps of Fishtown until this date. With this date, 3rd August 2017, the Freija Nücke Territoria declared full independence from the Fishtown Newport Territory. The inhabitants, all members of the same family clan, forming the new administration, declared independence and not longer to be a part of the Fishtown Newport Territory, but willing to cooperate densely further on. They continue using the same flag as the FNT, but only including the crown symbol, and established an own postal service, independent of the CPEA-contracts or other co-operations in this concern. 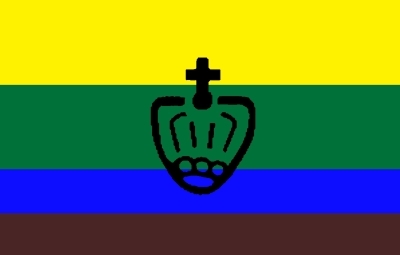 After consulting later on various definitions of a "Micronation" and visiting a lot of other Micronation websites it was stated that the FNT is nothing different - except that it have no typical government or "Head of State" and no constitution or similar declaration about the political form of state. Turning the FNT into a real Micronation was finally denied by the Chief Administrator who can be considered as the only "Master next God", the political system is simply: Autocratic. All Decisions concerning the Territory and its belongings are finally in his mind without any alternative. So due to this fact the FNT can be considered as nothing else than a Micronation as well. In use for diplomatic and other political interactions the flag of the FNT is also used with a symbolized crown in the center (which is also the flag of the Freija Nücke Territoria), for diplomatic contracts is used the coat of arms. As described above close relations exist to the FM and the Republic of Capricornia. Diplomatic Relations were also established to the Forstendom Holkau on 2016, March 9th. The Chief Administrator of the Forstendom Holkau, Mr. Holger Kaufhold, is named as representative of the Fishtown Newport Territory, responsible for the diplomatic and consular functions for and on behalf of the FNT in the Forstendom Holkau. Visa Versa, the Chief Adminsitrator of the FNT will be in function for the diplomatic relationsship and consular functions. A Treaty of Friendship and Co-Operation was signed with the Grand Duchy of Flandrensis (Het Groothertogdom Flandrensis) on 2016, March 16th. A Treaty of Friendship and Co-Operation was signed with the Principauté d'Aigues-Mortes on 2016, August 01st. A Treaty of mutual recognition was signed with the Anacratic Republic of Padrhom (République Anacratique du Padrhom) on 2016, August 03rd. A Treaty of mutual recognition was signed with the Emire of Angyalistan on 2016, September 09th. A Treaty of Friendship and Co-Operation especially in relation to external, diplomatic and economic belongings had been established with the Freija Nücke Territoria after its independence from the FNT on 2017, August 9th. A Treaty of mutual recognition was signed with the Principauté de Bérémagne on 2018, February 20th. A Treaty of mutual recognition was signed with the Principauté de Lochaber on 2018, august 11th. Relationsships can be requested by contacting the Chief Adminsitrator. (Email to: fnt(emailsign)fnt.bernhard-krauth.de). A relationship with the FNT might have the advantage of creating a special (cheaper) postage fee agreement as existing for the FM. On December 8th, 2016, the FNT became a member "francophile" (in the sense of friend of french language) of the MicroFrancophonie, an organisation assembling french speaking Micronations. The FNT consists of approx. 78 m² not-owned ground inside a North German town called by certain locals "Fishtown" due to its history in fishing industries. It is the second biggest sea port of Germany. 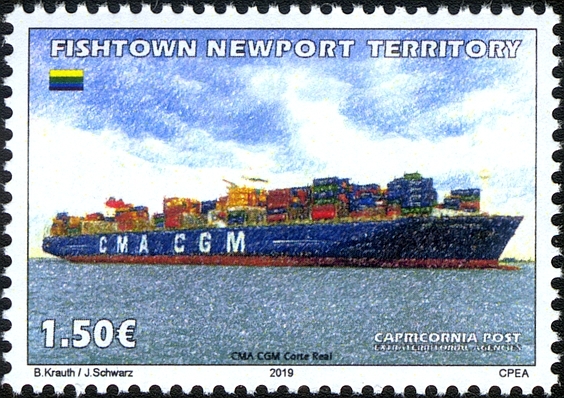 The location of the FNT in the City is on the border of a basin of the port area called "Neuer Hafen", in English Newport. The Territory consists of a major part of ca. 72 m² plus a close-by separated area of ca. 6 m². Currency of the FNT is the same as in the surrounding State of Germany, the Euro (€). Official language is Englisch, main languages in the FNT are German, English and French, but also other idioms like f.e. Kur-Palatine (local dialect of the area of the town of Heidelberg) and East-Frisian are common. 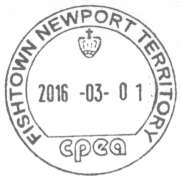 The Fishtown Newport Territory is semi-permanently inhabited by the Chief Administrator, occasionally also by other persons. A special agreement was done with the Republic of Capricornia (a state in the FM ) concerning postal services in the Territory. The Postmaster of the Capricornia Post decided due to the request of the FNT the foundation of the Capricornia Post Extraterritorial Agencies (CPEA), and postal services were offered in the Territory from 2015 May 28th. These services are carried out independently of the CPEA. The CPEA and the FNT agree together about postage fees, design and themes of stamp editions and other questions of the postal service. The supply of post stamps is done by the CPEA, therefore the CPEA gets from the FNT any financial result of selling these stamps abroad in some way as f.e. to collectors. The FNT is keeping itself only the financial gains generated by the postal service. As the Freija Nücke Territoria established immediately with its declaration of independence an own postal service the FNT stopped immediately the supply and support of postal services from Freija Nücke on 2017 August 3rd. Direct postal service from the FNT to the Territoria was suspended except for diplomatic exchange. Based on lateron done agreements and co-operation contracts, valid from 2017, August 9th, new postal fees were settled for the postal exchange with the Freija Nücke Territoria and postal services towards the Territoria available again. Due to the small size of the Territory inside postal traffic is free of charge. // Measurements apply according the Deutsche Post regulations. FNT-stamps should preferably be fixed on the backside of the envelopes. 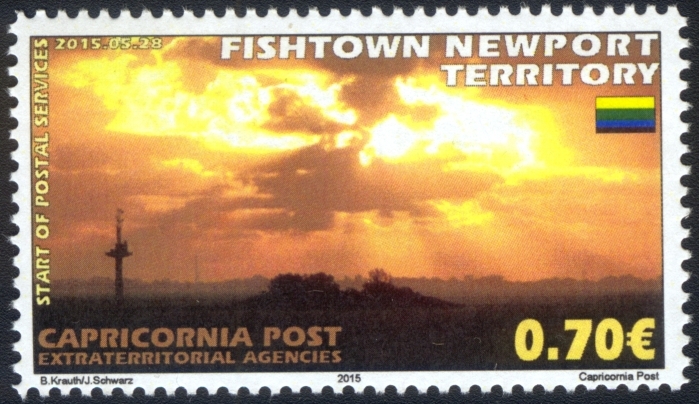 Posting on the front side can be done when they are clearly seperated from other stamps used for the transport with other service providers; and is compulsory for postings exclusively by the FNT postal services (usually only applying for postings inside Fishtown City or to FM-Countries when not using additional postal services). Stamps can be used for posting only directly after buying them, once exported a re-import into the FNT for postal use is not accepted. The following table is valid as from 2019 January 1st. Other Countries more than 2 kg is not provided by the FNT – Postal Service. * Applying also for postings to recognized Embassies / Consulates of the named Countries. Type: Postmaster stamp to assure postal service; red overprint of an old French permanent value stamp of 1978 (Michel-No. 2080xw); perforation K13. Theme: Due to the situation that the implementation of the postal service by the CPEA suffered by some delay the Administration of the FNT decided to make at least some postal service available by ink-printing on some old unused French stamps. 80 stamps had been realized. These stamps are showing instead of some value the words "POST PAID" and came into service on 2015 May 28th. These stamps were not sold and only used by the FNT postmaster on letters posted from the territory, to indicate that the postal fees had been paid. As also an official postmark for obliteration was still missing the postmasters private postmark was used for that purpose. The use and validity of these stamps was suspended on September 1st (2015) when the official postmark was finally available in the territory, and released by the permanent values of the territory (Nos 3 to 7, see below). From the 80 overprints remained 42, so only about 30 pieces had been used (8 pcs kept for documentary purposes in the FNT and CPEA). From the remaining 20 were destroyed immediately, the other 22 overprints kept for distribution to collector purposes. Attention: Due to the ink-overprint the color is not water-proof and might be washed away in intense contact with water. Perforation: Line 11,5 printed on (almost invisible) gummed, non-fluorescent paper. Printed in sheets of 3x7 stamps. Theme: Commemorative stamp for the Start of the Postal Service of the FNT. The picture is showing a sunset over the peninsular-island of Langlütjen in the river Weser estuary as it can be seen and was photographed from the Territory. 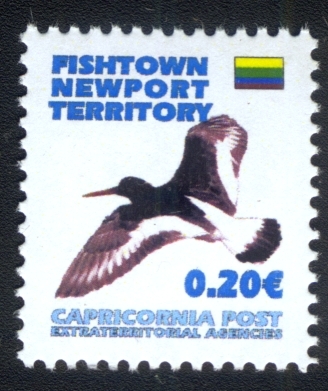 All FNT-stamps will carry the territorial flag and name as well as the Capricornia Post Extraterritorial Agencies - indication. As this stamp was available already earlier then the official postmark and the delivery of this postmark delayed the stamp was finally set in use additional and aside to the postmaster stamp (No. 1) and cancelled as well with the personal postmaster postmark. With the delivery of the FNT official postmark cancelation was done from September 2nd 2015. Perforation: Line 11,5 printed on (almost invisible) gummed, non-fluorescent paper. No. 3 to 5 printed in sheets of 8x6 stamps. No. 4 and 5 are printed attaching to each other in the middle of the sheet, the No. 4 covering with 24 pieces the top, and the No. 5 with 24 pieces the lower part of the sheet. So per sheet only 6 vertical pairs of the No. 4 and 5 are possible. Printing these stamps alone in a sheet might be realized in the future. No. 6 and 7 printed in sheets of 8x4 stamps. No. 1a: 2017, April 4th, were delivered 5 new printed sheets of the 10-Cent-value. This second print is very little variating in the colors, the sea dove is a bit less in contrast and little more grey in color. Therefore this slite varion, even as still in the range of usual printing allowance, will be listed as No. 1a. No. 4a: 2019, March 12th, was delivered a new stock of this value, but this time printed in sheets of 8x6 stamps without containing on the lover half part the No. 5. 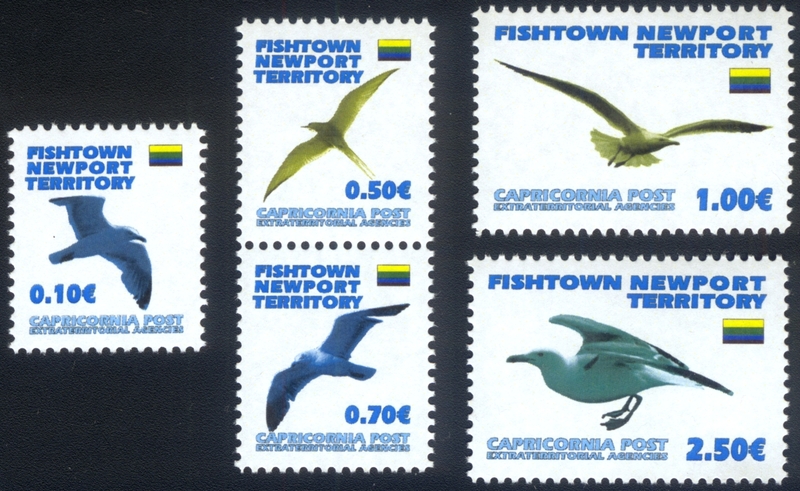 The stamps are identical with no difference to the former prints except on the upper anfd lower edge of the sheet: The upper edge contains now the flag of the FNT (and not any more the CPEA-logo as before), while the lower edge is carrying the CPEA-logo as before on the No. 5 situated there. So No 4a stamps can be only identified when they are connected to the sheets upper or lower edge. Theme: Following the standard theme of Capricornia Post stamps for permanent values the theme are birds. As the FNT is situated on the seaside, sea doves and similar birds are shown. Perforation: Line 11,5. The paper is quite rough, when separating at the perforation faults in the perforation occur regularly, so a non-perfect perforation usually have to be considered as "normal"
Printed on (almost invisible) gummed, non-fluorescent paper. Printed in sheets of 3x8 stamps each. Theme: Fishtown Newport is lying at the sea side directly aside at one of the busiest ports in Northern Europe. This means that all kinds of ships are visible directly from the territory or just a few steps away. 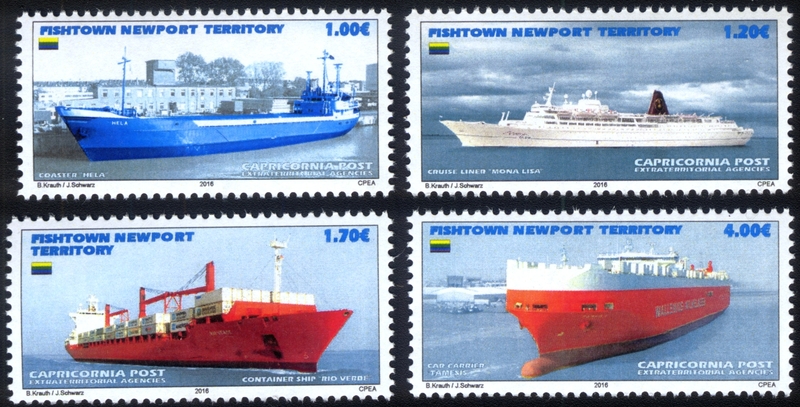 This set of stamps like to present the four most common types of ships. All of them have been here within the last years and some of them can be seen from time to time still today. 1,00 €: Coaster Hela, IMO No. 6702284, Length 61,8 m / Breadth 10,0 m / Gross Tonnage (GT) 861, build in 1966. Still in Service under a different name in 2016. Typical type of ship for short range coastal services of general cargo and bulk. 1,20 €: Cruise Liner Mona Lisa, IMO No. 6512354, L 201 m / B 26,5 m / GT 28891, build in 1966. Beached and wrecked off November / December 2015. Typical type of ship for worldwide passenger transport, cruise voyages and liner services. 1,70 €: Container Ship Rio Verde, IMO No. 9261827, L 208,2 m / B 29,8 m / GT 25703, build in 2003. Still in Service under a different name in 2016. Typical type of ship for worldwide transport of standardized cargo in containers. 4,00 €: Car Carrier Tamesis, IMO No. 9191307, L 240,6 m / B 32,3 m / GT 67140, build in 2000. Still in Service under this name in 2016. Typical type of ship for worldwide transport of any kind of rolling cargo, mainly cars, trucks and heavy cargo on rolling flats. Perforation: Line 11,5. Printed on (almost invisible) gummed, non-fluorescent paper. Printed in sheets of 4x5 stamps each. 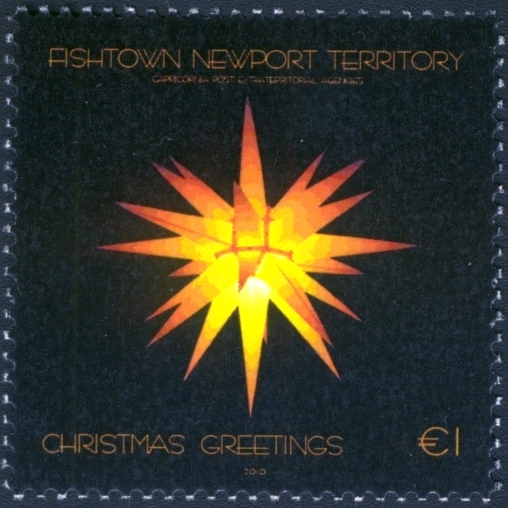 Theme: The Fishtown Newport Territory in 2016 is participating in a Joint Issue with the Federated Micronations and the Republic of Capricornia for a stamp designed to express greetings and best wishes for Christmas. The Joint Issue stamps of the cooperating Nations are therefore shown here as well. Perforation: Line 11,5. Printed on (almost invisible) gummed, non-fluorescent paper. Printed in sheets of 3x8 stamps each. 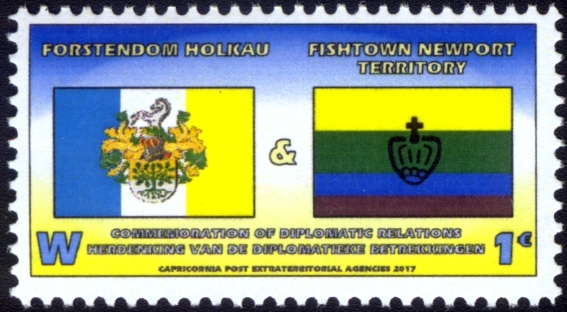 Theme: The Fishtown Newport Territory and the Forstendom Holkau entered exactly one year before, in 2016, March 09th, in dipomatic relations. This commemorative stamps is a joint issue of both Micronations to celebrate this event. The very special of this stamp is, that it is usuable for postage in both places. For the FNT the value is indicated with 1,00 €, for the Forstendom Holkau with the letter "W" for Worldwide standard postage. So this stamp can be poststamped either in the FNT or in the Forstendom Holkau. A very small number of First Day Covers (FDC) were produced carrying both postmarks on the single stamp. Perforation: Line 11,5. Printed on (almost invisible) gummed, non-fluorescent paper. Printed in 14 sheets of 3x8 stamps each. Theme: On the ground of lateron declared the Fishtown Newport Territory is settled allready since 2005 the german Jules-Verne-Club (www.jules-verne-club.de). 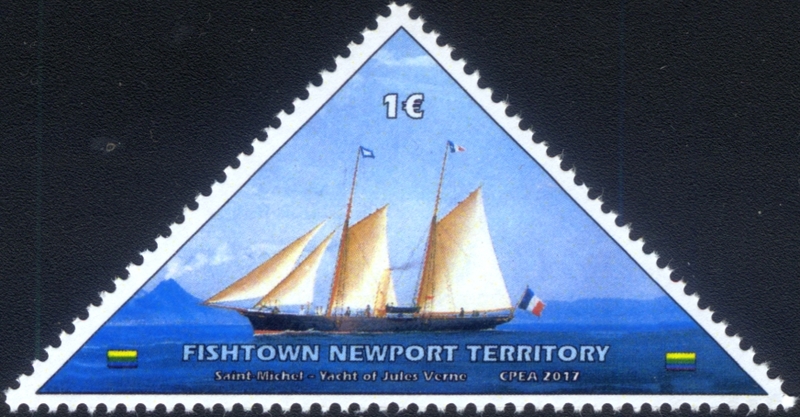 To point towards this fact, uniting the maritime influence in the FNT and in the life and works of Jules Verne (1828-1905, french writer) as image was choosen Jules Vernes third yacht, the Saint-Michel III (reproducting of a painting showing the yacht in front of Neapel; the original of this picture is owned by the City of Nantes). Printed in sheets of 8x6 stamps. Perforation: Line 11,5. Printed on (almost invisible) gummed, non-fluorescent paper. Printed in 10 sheets of 3x5 stamps each. Theme: Since 2016, December 8th, the FNT is member of La Microfrancophonie, an association assembling different french speaking Micronations. This organisation helds its second general meeting on 2018, July 21. and 22., in Vincennes, France. As ten members go to edit a commemorative stamp for this occasion the FNT is joining this idea. 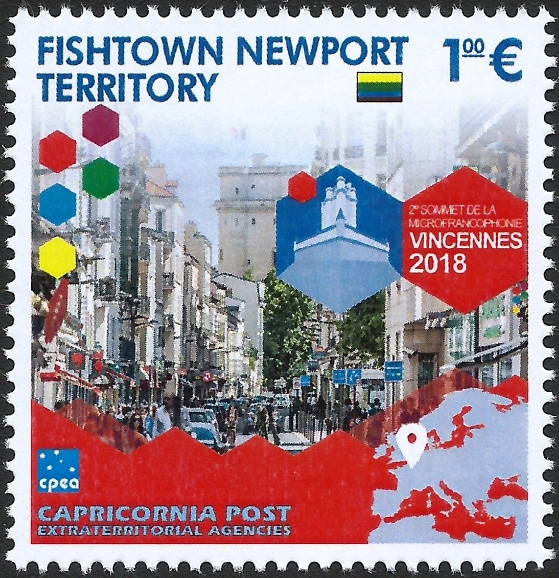 The picture and design of the stamp of all Micronations is the same, participating in this issue are Angyalistan, Padrhom, Nova Troie, Saint-Castin, Bérémagne, Aigues-Mortes, Hélianthis, Lochaber, Flandrensis. Additionaly the Federated Micronations placed their three stamps issued for the new territory of the Antilles Musiennes in a single sheetlet whereon the lower edge is placed the logo of the summit and salutions to the participants are printed. Perforation: Line 11,5. Printed on (almost invisible) gummed, non-fluorescent paper. Theme: Since 2016, December 8th, the FNT is member of La Microfrancophonie, an association assembling different french speaking Micronations. This special sheetlet commemorates the two years of membership. Perforation: Line 11,5. Printed on (almost invisible) gummed, non-fluorescent paper. Printed in 14 sheets of 4x7 stamps each. Theme: Fishtown Newport is situated at the sea side directly aside at one of the busiest ports in Northern Europe. This means that also the biggest Containerships of the world regular call this port, visible directly from the territory or just a few steps away. 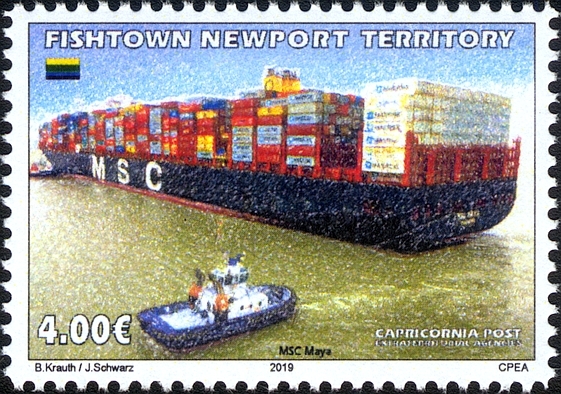 This set of stamps like to continue the initial set of this theme with a slightly different design showing some very actual "oversized vessels". 1,50 €: CMA CGM Corte Real, IMO No. 9454400, Length 365 m / Breadth 52 m / Gross Tonnage (GT) 150269, build in 2010. Picture was taken inbound to FNT before the North End of the Container Terminal. 4,00 €: MSC Maya, IMO No. 9708679, Length 395,4 m / Breadth 59 m / Gross Tonnage (GT) 192237, build in 2015. Picture was taken from another ship in front of the Container Terminal when MSC Maya was turning with tug assistance.